After years of not trying any new places to eat in St. George we decided these past two weeks to try again. Part of this was driven by our son who likes to eat lunch out and enjoys Mexican food. 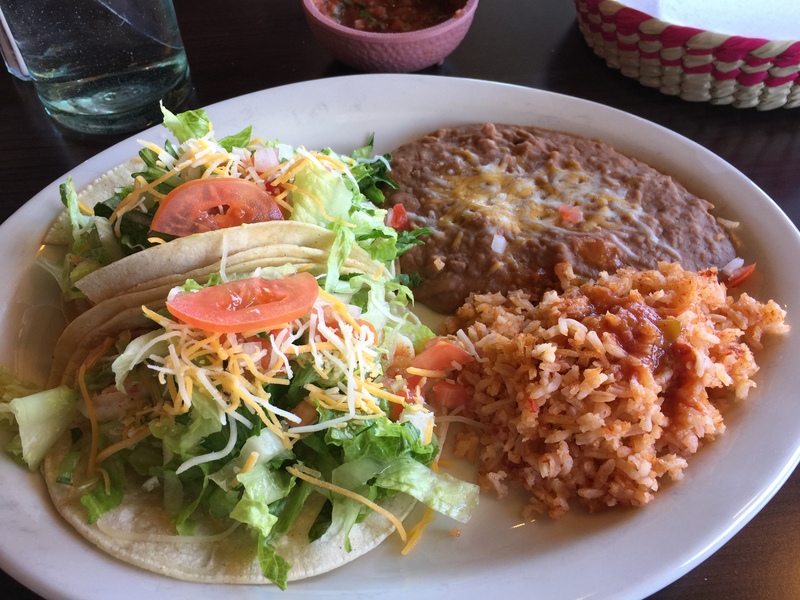 Mexican food is tricky for “dining lite” but if you order well and don’t overeat, it is doable. In order to not overeat I ate the insides of the tacos which were basically grilled shrimp, lettuce and tomato. There was no sauce, weirdly. I used some hot sauce that was on the table. I also ate one of the four small corn tortillas. A forkful of the rice that had lots of dried out, hard pieces was self-limiting. The beans were good but at this point I was so bummed by the meal that I just gave up. Sometimes “dining lite” is easier than you think! This entry was posted in Dining out, Legumes, pescatarian, rice, Shellfish, Vegetables and tagged Mexican rice, refried beans, shrimp tacos. Bookmark the permalink.